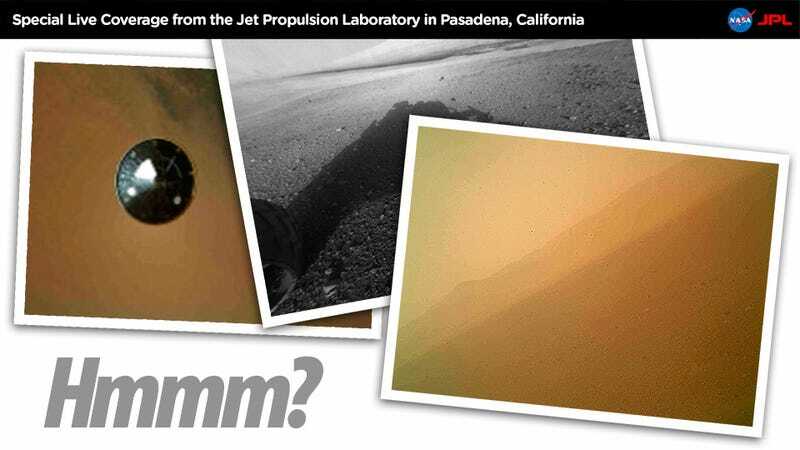 A lot of people are wondering why the first color image from the Mars Curiosity Rover looks so murky. Or why the black and white pictures look so low-resolution and out of focus in some areas. Calm yourselves. They will look absolutely amazing soon, perfect and in high-def. There's many good reasons why they look bad now. Today's image—Curiosity's first color snap—was taken by the Mars Hand Lens Imager (MAHLI), which, though clearly capable of photographing the horizon, is really designed to take close up pictures of martian rocks and soil. MAHLI is part of a Swiss-army-ish gadget arm that has five more instruments. Its color sensor is 1,600 by 1,200 pixels in size—just a 2-megapixel camera. More than enough to take close-ups of the objects that may get drilled by the other gadgets in the arm. Two megapixels is not that bad. In fact, it can capture plenty of detail, as the crop below clearly shows. So why does the image look hazy and murky? All the cameras onboard Curiosity are covered with transparent dust caps. These were installed to protect the lenses during landing. Engineers knew that the landing operation, with the skycrane firing its rockets over the rover, would produce a lot of dust: particles that could fly around and damage the delicate camera glass. So they placed protective covers on every lens on the vehicle to avoid scratches. They'll pop the caps off in the coming days, when they're confident that the lenses are out of harm's way. Now, this being NASA, there are failsafes everywhere: To account for the off chance that the the pop-off mechanisms fail, the engineers made the dust caps see-through. Which is why the cameras are still firing off images. Better to have blurry images than no images at all, right? That meant that Curiosity had beamed down a small version of the first image taken by the Hazcam. These thumbnails— which are 64 by 64 pixels in size—are like the icons for graphic archives in your computer, tiny previews that indicate the content of the bigger resolution image coming next. The same happened with color video of its descent. That video is also made with thumbnails, the ones taken by Curiosity's belly camera: MARDI, the Mars Descent Imager instrument. Those images are originally 1,600 x 1,200 pixel, so expect a full—and spectacular—high definition movie of the descent in the coming months, as the images get uploaded to JPL's computers. It takes a while, because, in case you haven't noticed, the Rover is on Mars. Which is very far away. The Rover is doing its best to send the photos to us as quickly as possible, but it's uploading them using radio waves. Today we only got the first color image, taken with an instrument that was not designed as Curiosity's primary camera. But Curiosity has many cameras. Twelve, in fact. Some of them capable of capturing 3D. Each of these cameras has a different function. There are Navigation Cameras: 3D black and white cameras used to drive the rover, mounted on the head of the vehicle. There's MAHLI, which is more of a science camera. There's the Laser-Induced Remote Sensing for Chemistry and Micro-Imaging, which is not a camera in the traditional sense, but one that will look into the composition of rocks with unprecedented detail and accuracy using a laser to vaporize rocks coupled with an spectrograph for analysis for the resulting plasma. And then there's Mast Camera, or MastCam for short. This is the one designed to capture the amazing color images, panoramas, and video (at 10 frames per second) in high definition. There are two of them, in fact, because they are designed to create 3D imagery. And they have very powerful zoom lenses too.